My husband and I had a soup weekend, but nothing is better than tortilla soup, especially for a Mexican food lover! My inspiration comes from Wolfgang Puck’s “Tortilla Soup,” Pizza, Pasta & More!, Random House, 2000. As usual, I did modify it just a bit, but it is wonderful! You won’t be disappointed!!! Heat the oil over low heat in a large pot. Add the tortilla squares and cook until they are slightly crisp. Add garlic, onion, jalapeno pepper and corn. Stir ingredients until they are coated with oil and simmer. Add the tomatoes, tomato paste and 2 teaspoons of cumin. Cover and continue to simmer for 10 minutes. Slowly pour stock into pot over low heat and cook until soup is reduced a little. (The recipe recommended by one-third, but I thought that was too much). Wait for soup to cool before putting a blender. Puree ingredients and then pour back into pot. Season with salt and pepper to taste. Add more cumin, if needed. Prepare the garnish: Preheat oven to 350 degrees. Cut the tortillas in half and in thin strips. Place on baking sheet and bake until strips are crisp. Peel and dice the avocado. Slice chicken into thin strips. Add avocado, corn, and chicken into pot. Keep warm until ready to serve. 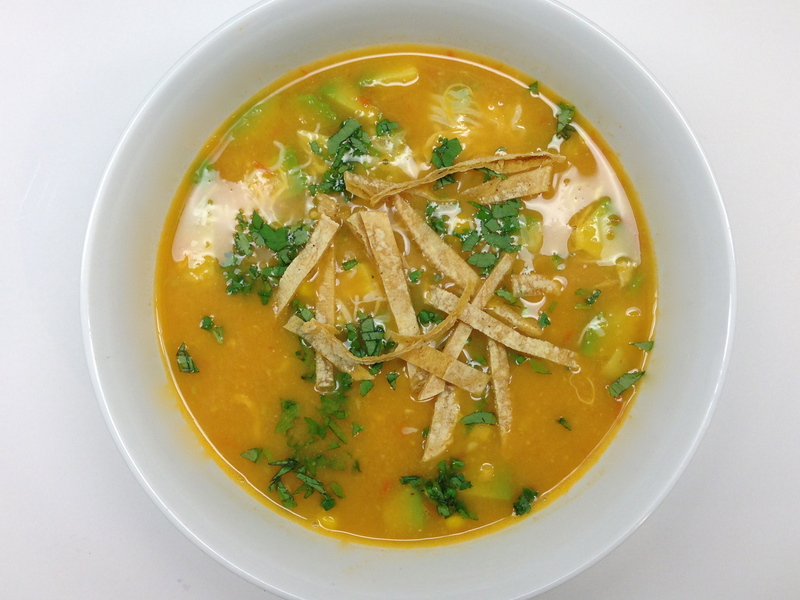 Place soup into bowls, add cheese, cilantro and tortilla strips. 6 to 8 servings. Hi Ema. Are you adding the cottage cheese to the soup for more protein?